In the UK, electrical faults are the single most common cause of household fires. This article was written with expert advice from electricians and electrical contractors and will explain the causes of electrical fires, preventative steps that everyone should take, and what to do if an electrical emergency happens to you. The vast majority of electrical fires arise at the point of power: the socket. Appliances fitted with the wrong protective fuse are the main culprits. If you change or replace the fuse in an appliance make sure that you do so with a fuse of the correct rating. Portable lamps, light bulbs and light fittings are another cause of household electrical fires. Like fuses, employing a light bulb with a wattage rating higher than recommended can easily blow and cause a fire. Never exceed the maximum recommended bulb wattage of any lighting fixture or lamp. Extension leads are handy to have around but should not be used for prolonged periods of time. 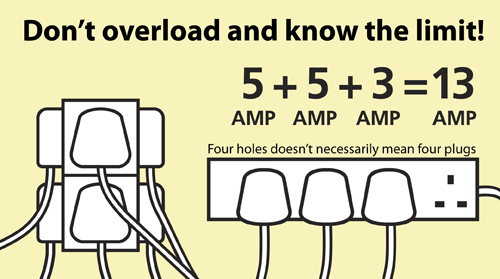 If you find that you are using extension leads or multi-sockets all the time, have your local electrician install additional power points. One of the most potentially dangerous appliances in any household. Portable heaters are often placed too close to combustible materials such as curtains, or used to speed dry clothes. If you use a portable heater avoid the old coil-type heaters which can ignite any combustible material or dust coming into contact with it. In terms of electrical faults and fires, older wiring systems pose huge problems to households. Outdated wiring can also mean outdated circuit breakers which may not trigger and cut off your juice until it is too late. Many such fires start in the fuse box itself and go undetected until the fire transgresses its confines. Electrical fire prevention is always the safest and best policy. Do NOT run power cables under your carpet. Any damage will not be obvious as you'll not be able to see it. The combination of damage to the cable and any heat being less able to dissipate could result in overheating, leading to a fire. Do not change or rewire electrical appliances unless you know what you are doing. Rewiring a standard plug correctly is not as straightforward as it seems. The poor rewiring of plugs, and fitting them out with the incorrect fuse, is one of the major causes of household electrical fires. PAT Testing is the means of having your electrical appliances tested by a qualified electrician. It involves a series of visual inspections and electronic tests. PAT testing is an industry standard test and the surest way to ensure that your appliances are safe. To have your appliances tested contact your local electrician. Electrical installations deteriorate over time. To ensure that the wiring in your house is in a satisfactory condition for continued use you should have it inspected and tested at regular intervals. Such safety checks are referred to as 'periodic inspection and testing' . Your local elcetrician will check your wiring and fuse box to make sure they meet current safety regulations. Smoke alarms are the best way to detect if you have a fire, make sure you have several installed and check them regularly. Unplug the affected appliance or switch off the power at the fuse box. Don’t risk your personal safety in any way. If you cannot safely contain the fire: get out and stay out. Do not try to save personal possessions, no matter how much sentimental worth they have. Dry powder fire extinguishers are one of the most versatile pieces of firefighting apparatus. Fairly inexpensive, dry powder fire extinguishers are suitable for use on many class of fire, including electrical fires. In the event that the fire evolves, is blocking your only exit or is so hot that you can’t get close enough to fight it effectively, then it's time to quit, evacuate your property and call the emergency services.